Is Oregon’s 2015 NFL Draft Class the Best in School History? When college football fans tune in to the games every Saturday, there is one team that is always easy to spot. Whether it is because of the shiny, colorful nature of the uniforms or the overwhelming speed of the team, the Oregon Ducks cannot be mistaken for anyone else. The distinct nature of Oregon football is not always seen as a positive, however. 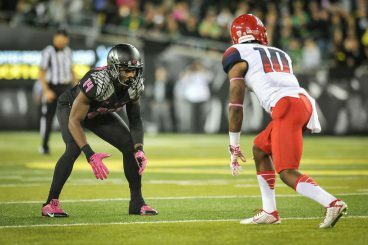 Many fear that the unique offensive scheme run by the Ducks raises red flags in terms of talent transitioning to the NFL, or that the team’s play-making defenders are too “soft” to make it in the pros. Despite the fact that Oregon is not known for its traditional NFL talent, the program is currently tied with Oklahoma and Wisconsin for the 10th most players suiting up on Sundays with 43. Quarterback Marcus Mariota has a chance to be selected first overall. With a number this high, it seems unjust to place an asterisk next to Ducks players because of the system they run. Yet, the experts continue to put down quarterback Marcus Mariota as a pocket passer compared to Florida State’s Jameis Winston. Even with these negative stereotypes surrounding Oregon’s players, there is no question that the Ducks have become one of the most effective NFL factories in the nation. And, with that being said, the 2015 NFL Draft class is likely to be the best in school history. The most Oregon players ever taken in a single draft was six, which has happened in 1972, 2002, and 2009. This April, there could be as many as 11 Ducks selected. 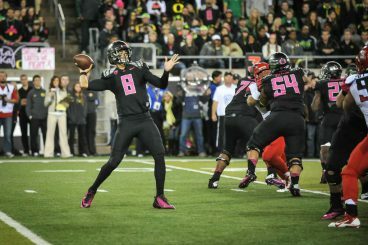 The standouts are quarterback Marcus Mariota, who has a chance to go first overall, Arik Armstead, Ifo Ekpre-Olomu, Hroniss Grasu, and Jake Fisher. Others who will certainly be examined in the later rounds are Tony Washington, Erick Dargan, Derrick Malone, Troy Hill, Hamani Stevens, and Keanon Lowe. Of those 11 total players, six are virtual locks to be drafted, which essentially guarantees that the 2015 class will at least reach that high mark of six, if not eclipse it all together. The quality of this class is at least as impressive as the quantity. Mariota, Armstead, Ekpre-Olomu, Grassu, and Fisher are all elite prospects at their positions, each making a case to be considered a Top-5 player in his respective area. Mariota and Fisher, an offensive tackle, also showcased Oregon’s exceptional speed in the 40-yard dash at the NFL Combine this past weekend. In fact, Fisher nearly outran Jameis Winston. If Mariota were to go first overall to Tampa Bay, he would join 1955 selection George Shaw as the only two players to be the first off the board in the NFL Draft in the school’s history. Oregon’s class also stacks up favorably against other top college programs. 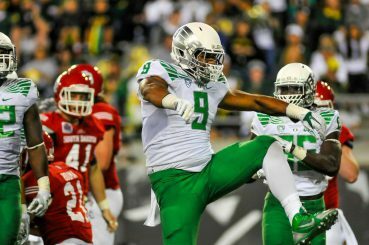 Mariota, Armstead, and Ekpre-Olomu, who would have likely been a lock if not for an injury late in 2014, all have shots to be selected in Round 1 of the NFL Draft. The only other programs that will likely even have a shot at three first-round selections are Washington with Shaq Thompson, Danny Shelton, and Marcus Peters, and Florida State with Winston, Cameron Erving, P.J. Williams, and Eddie Goldman. Perhaps the most impressive element of the 2015 Draft class compared to other great groups in school history is the diversity. In recent memory, if six Oregon players were going to be drafted, most would have likely guessed that at least a couple of them would be undersized but shifty skill guys. In 2015 however, things look significantly different. Of those five studs listed above that will likely be taken in the first two or three rounds, four are either linemen or defensive players. Even Mariota, a dual-threat quarterback, is not the typical Ducks passer. He is accurate with a very strong arm, and has prototypical size for a pocket passer that NFL scouts love. Of all 11 players listed above, Lowe, the wide receiver, would be the only receiver or running back taken for the Ducks, should he be drafted. This marks a huge difference from the past five or six years when it seemed that each spring Oregon fans were tuning in to find out where their favorite 1,000-yard rusher would be taken in the draft. The 2015 Oregon draft class also shows how far the program has come in a relatively short period of time. Of the 164 Ducks ever selected starting in 1936 with the first ever draft, 52 (31.7 percent) have come in the last 15 years. Following the Ducks’ undefeated regular season in 2010 and appearance in the national title game against Auburn, Casey Matthews was the lone Oregon player drafted the following spring. 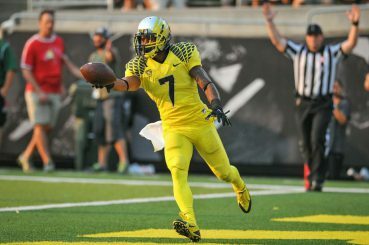 The vast difference between the 2011 and 2015 draft classes demonstrates both the unconventional talent the Ducks have used to win in the past and the fading stereotype regarding the Ducks’ inability to translate into the NFL. There is no doubt that Oregon football has produced numerous NFL standouts throughout its history. However, the program has reached a new level of success over the past few years, and with it has come improved recruiting and increased respect from NFL scouts. Even if only six of those 11 Ducks are selected in the 2015 NFL Draft, it is fair to say that it will be one of, if not the best, draft class in school history.